Years after MGM’s heyday of musical productions, the studio released this gem: Fiddler on the Roof (1971). I remember the many New Year’s Eves where my sister Madison insisted on watching this three-hour film to pass the time before we stomped on bubble wrap at midnight. We would dance around the television with our hands in the air à la Topol (as Tevye) performing his “If I Were a Rich Man” musical number. The opening shot of the film pans along the skyline of a Russian town. It leads to a shot of the famous fiddler as the sun rises, all before the film breaks into the first production number “Tradition.” That moment of the fiddler standing atop a home with the orange sky behind him inspired this design. 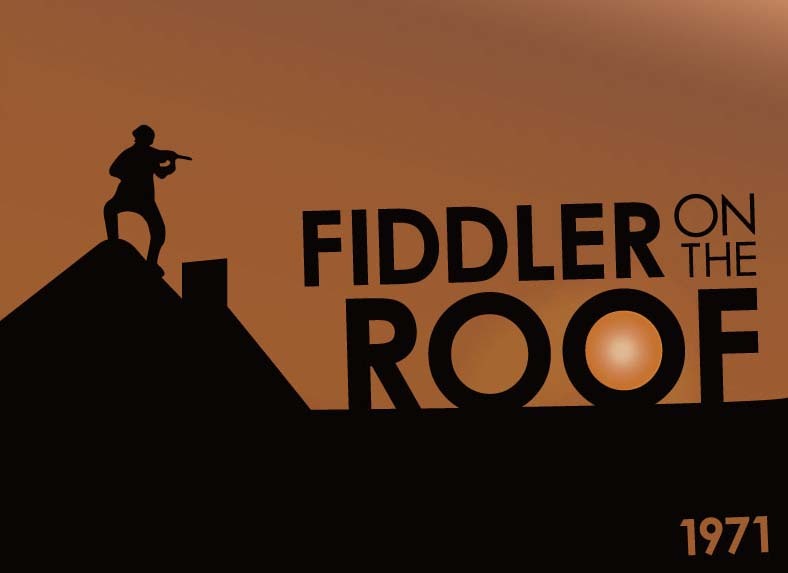 In fact, the shadow of the fiddler on the roof set itself up as the iconic image used on many covers for videos and DVDs. Thanks to my mom for suggesting this film as a design for this series!